It is essential that hand-made cigars are kept in their ideal environment as they will quickly deteriorate and the humidor has been especially designed to do just this. Some are just straight forward boxes others may have trays and/or dividers that will allow different brands of cigars to be placed in the same humidor and also allow a more even humidification. 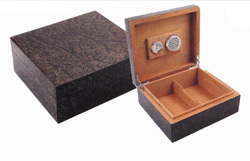 The humidor should be lined with Spanish cedar, have a lid that has a tight seal when closed, therefore it should be quite heavy, and therefore the hinges should be of high quality. The main factor is humidity which should be checked on a daily basis to ensure the humidity is kept between 65% and 70% and at 20degC. 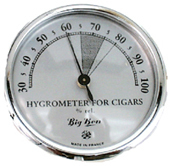 To do this, the ideal humidor should be equipped with a humidifier and a hygrometer. The humidifier consists of a medium that will absorb water eg oasis (ensure it is distilled water) which is housed in a plastic or metal ventilated case. This will allow the water to vaporise and thus keep the cigars in good condition. 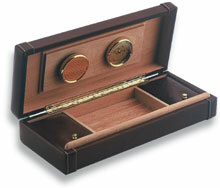 The unit is usually held in place on the inside lid of the humidor by use of a magnet. 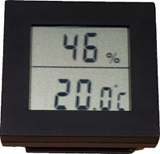 In order to maintain the correct level of humidity, a device called a hygrometer should be installed alongside - there are two types – digital and analogue the digital is easy to read and does not require calibration, the analogue is often bulkier, must be calibrated and is less accurate. To help reach the required humidity level in a newly acquired humidor, it will need to be prepared by charging the humidifier and then to close the lid and wait until the required level of 70% has been reached – it may take a few days. Once this has been achieved the cigars can be added but make sure that the humidor is placed in a position where the temperature does not exceed 20 Deg C, is away from direct sunlight and radiators etc. Control of the humidifier is achieved by recharging it if the reading is below 65%. If above 70%, remove the humidifier and/or leave the lid open until the reading is correct. However, the best way to know if the cigars are maintaining their quality is to physically check them on a regular basis. Note: Always remove the humidifier when adding the distilled water/humidifier solution and make sure the housing has been wiped dry before it is re-installed. It is also essential to air your cigars regularly by opening the humidor lid for short periods and by changing their position in the humidor ie move them from top to bottom. If a white mould appears on the cigars, worry not, this is called ‘bloom’ and needs to be gently removed with a soft brush. Beware of the Tobacco Beetle or weevil. The signs are easy to spot as the cigars will have evidence of small holes. The eggs of the beetle lie dormant in the cigar and despite a rigorous effort to destroy them by the manufacturer, some will survive. When the eggs hatch, the larvae then begin to chew their way out, leaving not only neatly drilled holes but piles of fine dust. If the cigars have been infested with the weevil, it is probably best to destroy the box and its contents immediately and under no circumstances put them into your humidor. It is a rare occurrence to find the Tobacco Weevil in cigars purchased from a reputable company particularly if they have – in the case of Havanas - EMS (English Market Selection) stamps on the boxes. These stamps, bearing the symbol of a lion, were introduced by Hunters and Frankau to indicate that the cigars have been designated for the British market and that they are of high quality. The same cannot be said for counterfeit cigars which are very often subject to weevil damage.